Minimises risk of irritation. Restores natural pH. Keeps skin healthy. Dermatologically tested. 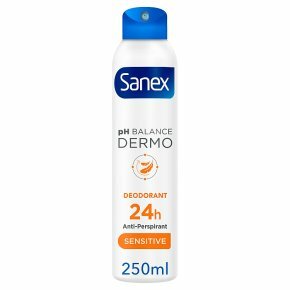 Keep your sensitive underarm skin healthy with Sanex Dermo Sensitive 24H Anti-Perspirant Deodorant. Dermatologically tested, with no alcohol, it works round-the-clock to protect you from odour without upsetting your skin's bacterial flora. Tough on sweat and gentle on skin to keep you fresh and dry all day. Instructions: Apply only on healthy skin and stop use if irritation occurs. Shake well before use. Hold can in upright position 15 cm from underarm and spray. Allow to dry before dressing. CAUTION: Extremely flammable aerosol. Pressurised container. May burst if heated. Keep out of reach of children. Keep away from heat, hot surfaces, sparks, open flames and other ignition sources. No smoking. Do not spray on an open flame or other ignition source. Do not pierce or burn, even after use. Protect from sunlight. Do not expose to temperatures exceeding 50°C/122°F.